A NEW STUDY has shown a major decline in the average alcohol intake of an Irish person over the last decade. The study from DCU’s Business School showed that alcohol consumption has fallen significantly since 2008, and had also fallen significantly in the earlier part of the decade. While some of this drop-off is attributed to cross-border shopping, which would offset some of the reported drop in intake, the current figure – of 12 litres per adult – is still significantly lower than it had been in 2001, when it stood at 14.4 litres. Those figures reflect the quantity of ethanol, rather than merely alcohol drink – meaning the average 12-litre intake equates to an average of 422 pints of cider. Anthony Foley, the economist who undertook the study, said the 2011 figure was likely to be revised even further downward given the new census which showed a higher-than-expected spike in the population. With similar revisions then due for the years 2007 to 2011, the average input figure was likely to be lowered to 11.8 litres. “In international terms, average consumption increased in several OECD countries but declined in Ireland,” he said. The average intake reached its lowest in 2009, when it stood at 11.4 litres – the equivalent of just over 400 pints of an average cider with an alcohol volume of 5 per cent. 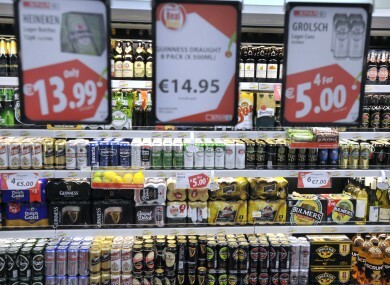 The Alcohol Beverage Federation of Ireland, which commissioned the report, said the figures should be taken into account by policymakers when formulating their national alcohol policy. The report can be read in full at the ABFI website. Email “Alcohol consumption down by 17 per cent over last decade”. Feedback on “Alcohol consumption down by 17 per cent over last decade”.